An estate agents window display is visible to passing trade 24/7 so needs to be optimised to achieve maximum results. A well thought out window display can help boost your footfall and turn passers by into customers. There are multiple ways estate agents can display their rental or sale properties in their window, as well as their opening times or relevant news. 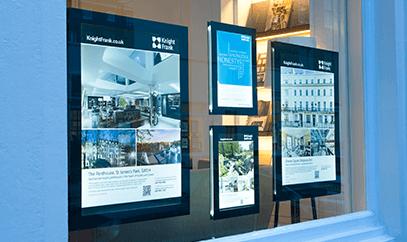 Here, we take a deeper look into how estate agents can maximise their window displays to boost footfall all year round. Make a great first impression with your window display. How do I make the most out of my window display? A window display is the first impression people get of your business, so it is crucial that you are making the most out of it. Your display should be clear, professional and up to date. 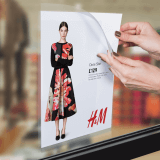 The housing market is moving quicker than ever, so maintaining your window adverts may be something you have to do multiple times a day, but it will be worth it. As a house hunter their is nothing more disappointing than seeing a house advertised to later found out it is already sold or let. Create a good first impression by having the most up to date window in the business. Your window promotions should attract attention, which can sometimes mean showcasing your most amazing houses. Passing trade won't be interested in what they need, show them what they want. This way, even people who may not be looking to move home will stop and look, making them likely to come back when the time for them to move arises. What information should I have in my window? You should have a good selection of your current portfolio available in your window. This way, if people aren't ready to come in and discuss their options or are passing by out of hours, your window display is doing the work for you. You should have high end, low end, rentals, sales, STC and non-residential properties in your window where possible. A broad selection shows you are the first choice for many. On each individual advertisement you should have at least one image of the property along with the price and a small synopsis. Make the advert intriguing, make people want to know more and come inside. Your window should also be home to your opening hours and contact details. A passing pedestrian might fall in love with their dream house, but unfortunately it's 7pm on a Tuesday. Make sure they have your number and opening times right in front of them to help you build that relationship and secure the sale. What products are best for estate agents windows? Utilising your space is key. Many estate agents are based on high street corners where they have a great window display that can be seen from two or more roads. 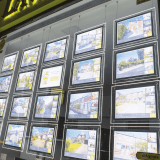 Whether your window is straight, curved or spread round a bend, cable displays are perfect for estate agents. 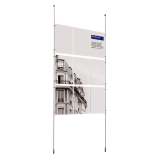 Available in many different styles and configurations, our cable kit displays can be suspended from your ceiling or wall to display A4 or A3 adverts. 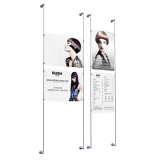 They create a clean and professional display that can be placed in your window to be viewed by passing trade and customers inside. 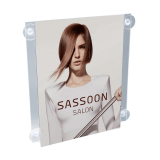 The clear acrylic nature of each unit means you can have a double sided display. Cable display kits are also available with built in LEDs. This is the ultimate POS solution for round the clock advertising or the darker winter evenings. Not only will your window display and housing adverts stand out, but your whole premises will shine bright along the high street, making you the focal point of everyones attention. 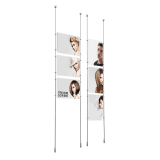 A cable display kit is an absolute must for any estate agent window display. Once your properties are perfectly displayed, it's time to focus on utilising any left over space. 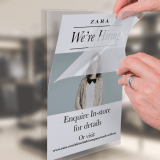 For your opening hours, contact details or local events notices, window cling poster holders are great. They are simple, easy to update and affordable. If all of your window space is full, you can place these on any glass panels of your front door. Perhaps you have an offer on for low fees or a first time buyers advice clinic, for events like this, we recommend using a suspended poster hanger. 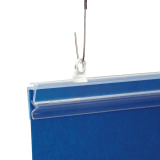 This allows you to suspend large scale posters from your ceiling directly into your window. This is a great alternative to property displays to help make you stand out from the competition. For help kitting out your indoor POS displays, read our complete essential POS for estate agents guide.